Search for the best flight prices from Manchester to Catania. Compare prices, book today and save money with Manchester Airport. Choice is your biggest problem in Catania. 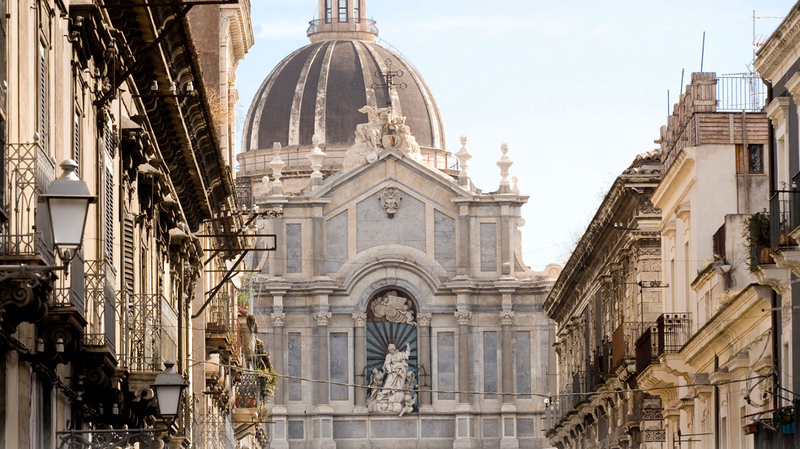 Catania puts you within reach of much of the island’s most alluring sights, including the commanding Mount Etna, the fabulous Greco-Roman theatre at Taormina and the stunning valley of temples at Agrigento. However, don’t be in too much of a rush to escape – the old town itself is a World Heritage Site. Mid-range hotels and family-run B&Bs abound in Catania, but there is also a good choice of budget hostels and luxury hideaways. Among the most opulent is the elegant four-star Liberty Hotel (Via San Vito 40), a must for art nouveau devotees. Nearby, the stylish UNA Hotel Palace (Via Etnea 218) boasts a rooftop terrace with panoramic views of Mount Etna, and is one of many choices near Piazza del Duomo and its pedestrianised offshoot Via Etnea. Those on a budget can check into the friendly Hotel Rigel (Viale della Libertà 63) near the station. Away from the centre is Hotel Nettuno (Viale Ruggero di Lauria 121), a box-shaped edifice that’s perched atop the rocky waterfront. The cobblestoned Via Etnea is the centre of Catania’s shopping district. This route connecting Piazza Università and Piazza del Duomo has a wealth of international brands and department stores, such as the all-encompassing Coin (Via Etnea 112). Off to the side are narrow lanes and roads featuring independent shops that sell a range of items. La Peschiera fish market near Piazza del Duomo is worth a look for the entertainment value alone, as vendors gesticulate and bellow to attract customers, while the bustling La Fiera market (Piazza Stesicoro) is a great place to find bargain clothes and gifts. From simple osterias and family-run trattorias to first-rate restaurants, Catania has a good choice of places to quell any hunger and thirst built up from walking the city’s streets. Many of the eateries here focus on Sicilian cuisine, which uses an abundance of fish and freshly made pasta, including local favourite pasta alla norma (pasta with aubergine and ricotta). Spend an intimate evening at Ciciulena (Via Anotonino di Sangiuliano 207), which gives the regional cuisine a modern twist. Cheap eats are plentiful here, with numerous snack bars, bakeries and food stalls. For an inexpensive lunch, head to Pescheria Fratelli Vittorio (Piazza Pardo) in the fish market, which serves up fresh fish cooked to perfection. This almost overwhelming celebration of the city’s patron saint culminates in a parade through the streets, where white-shirted locals haul a statue of the saint on a fercolo (cart) through the masses. This nine-month cultural extravaganza features everything from mythology and puppetry to cinema with exhibitions, performances and screenings all under the Etnafest ‘umbrella’. Taking place in Acireale, 20km from Catania, this colourful celebration involves vibrant costumes, decorated floats and lively concerts. There’s also a chance to try local foods and wines. This gruelling cycle race (78km for men and 64km for women) for professional and accredited participants involves rugged trails on the might of steaming Mount Etna from the nearby town of Milo. Sit back, relax and listen to soothing tones at this feast of jazz. Running since 1983, this festival encompasses a series of concerts over a seven-month period at various venues in Catania and at Tremestieri Etneo, 8km north of the city.